After the $16 Billion Vinik funded rail tax passes, the Vinik bailed out Tampa Bay Times is now asking questions they should have been asking before the election. The Times began asking what happens to the 10 year $812 million road funding plan the county commissioners had already voted to fund. The Times made endorsements in county commission races and they somehow "forgot" to ask any of the commission candidates this question. They did not ask any sitting commissioner before the election either. We could not find an online version of yesterday's Times article so a scanned copy of the print version is below. The title is misleading and information is wrong in this article. There are no guarantees that funding from the 10 year road funding plan will not be diverted. The 30 year tax will raise an estimated $280-$300 MILLION in the first year. The state of FL estimates the sales tax will raise $300 million in 2019. Using the same growth rate the MPO used in their 20 year 2040 long range plan, the tax will generate at least $16 Billion over 30 years and probably more. $9 Billion is totally wrong because that is what the MPO's 2040 long range plan stated 4 years ago would be raised with a one percent tax over 20 years not 30 years. The 10 year transportation funding plan was implemented beginning in FY2017 to fund road improvements and new road capacity using the existing growing county budget. 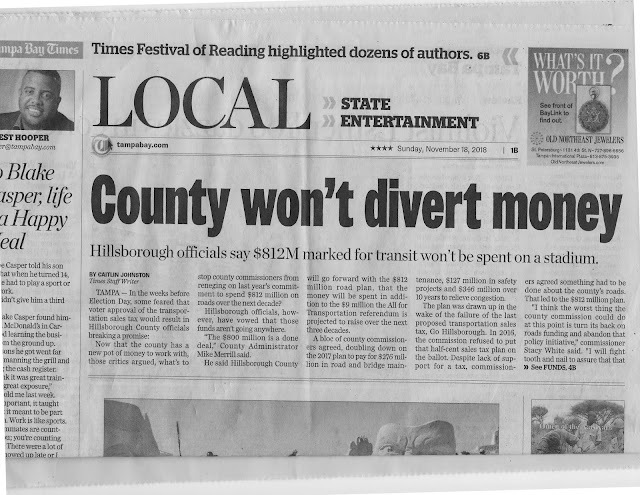 The Times reported back then that the 10 year road funding plan was put in place by a Board policy voted on by the county commissioners - with no guarantees or obligations for future boards to oblige by the policy. ...plan required maintenance and safety improvements will be first in line. Murman, though, worried Higginbotham’s plan would turn into a “shell game.” Without dedicating money first to transportation, she said, there was no guarantee future boards would oblige Thursday’s decree. “The new plan has more flexibility but it has less certainty,” Murman said. There was no ordinance passed or any authoritative decree passed that forces future boards to abide by any of it. Future boards can change or amend Board policies or simply eliminate them. Remember the 30 year Community Investment Tax (CIT)? Promises were made and promises were broken by a future Board. Could all or any of those hundreds of millions of tax dollars get freed up for other things like a billion dollar baseball stadium? Freed up for other pet projects? Or are those funds still be needed to fund new road capacity? The $16 billion All for Transportation rail tax has prohibitions and limitations on funding new road capacity and provides ZERO dedicated funding for new road capacity. The fact is the only time additional automobile lane capacity is ever mentioned in the $16 billion rail tax charter amendment is to enforce the prohibition of funding them. Now newly elected Democrat county commissioner Mariella Smith admits it. Smith said that funding is needed for road widening projects that are not covered by the [$16 Billion] tax. The Times endorsed Smith and they somehow "missed" asking her these questions. 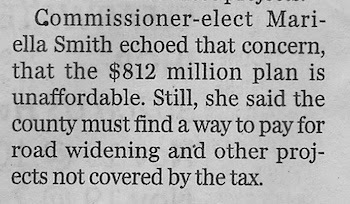 Smith was publicly silent on the massive tax hike during her campaign and said it was an issue for "voters to decide". But Smith knew there was an issue that the $16 Billion rail tax did not fund the needed new road capacity. She failed to speak up and inform countywide voters and taxpayers that road widening and new roads would have to be funded elsewhere. The Times also endorsed the newly elected countywide commissioner Democrat Kimberly Overman. They "missed" asking her anything either. Overman publicly supported the $16 Billion rail tax. Overman has been a member of the Hillsborough MPO's Citizens Advisory Committee for several years. She knew the MPO's 20 year 2040 long range plan included a billion dollars of dedicated funding to new road capacity in its one percent sales tax funding scenario. She knew there was no dedicated funding for new road capacity in the 30 year rail tax and she also failed to inform countywide voters and taxpayers that new road capacity must be paid for elsewhere. How much overlap is there between what was already funded for 10 years and what the tax hike is funding? Does anyone even know? All for Transportation sold the $16 Billion tax hike as fixing the transportation issue in Hillsborough. Did voters expect to pay both the $812 million AND the $16 Billion? If the $812 million transportation plan must fund new road capacity because new road capacity funding was intentionally left out of the $16 Billion rail tax, those who supported the rail tax have some explaining to do. Brian Willis, a spokesperson for All for Transportation, has also been on the Hillsborough MPO's Citizen Advisory Committee for years. He was President of the local transit lobbyist organization Connect Tampa Bay (that was suddenly disbanded in 2016 after it was publicized they never filed their federally required tax returns). Willis knew the MPO's talking points of a $9 Billion transportation needs backlog was not just needs for locally funded transportation projects. That backlog included improvements to interstates, state and federal roads and bridges, needs of the airport authority, the port authority and the expressway authority which are not funded by a local sales tax. Willis knew the MPO's 2040 long range plan included a billion dollars dedicated to new road capacity over 20 years yet his $16 Billion tax hike did not include a penny of dedicated funding to new road capacity over 30 years. There is now $16 Billion of new local tax dollars available over 30 years for a $9 Billion backlog of projects that are not all locally funded. This massive tax hike can fund all the transportation costly wants, not just transportation needs. Now Willis states the massive $16 Billion tax hike was always intended to be an additional resource. That is outrageous and shows disrespect for the taxpayers of Hillsborough County. If there is no authoritative decree in place, county commissioners will make changes to previous decisions. The Times reported two days after the rail tax passed: Hillsborough commission pulls out of MacDill ferry plans, citing new transit sales tax hike. Ironically, commissioner Pat Kemp, who supported the $16 Billion rail tax and has been a big supporter of the ferry project, was the lone NO vote. HART will now be handed $7-8 BILLION. If Kemp, who has been sitting on the HART Board, does not think HART can handle the $50 million ferry transit project, how does she think HART can handle multi-billion dollar rail projects? The Tampa Downtown Partnership now wants to hand off to HART the funding of the Downtowner, the electric shuttle that operates through the Channel District, River Arts District, UT and recently expanded to Tampa Heights. The Downtown Partnership, who was willing to pay for this service that benefitted downtown, now wants county taxpayers to pay for their convenience. Taxpayers in unincorporated will be picking up the tab for costly rail/transit projects and other transit services in Tampa that has less than 1/3 the population of unincorporated. Those taxpayers also pay 2/3 of all property tax revenues to HART. 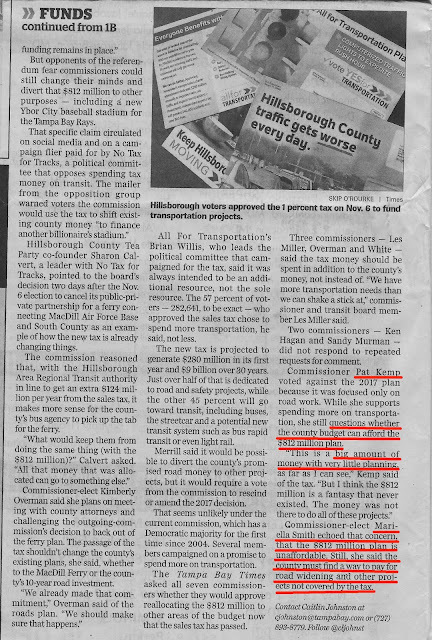 Yet the $16 Billion rail tax intentionally excluded dedicating any of the 30 year tax to much needed new road capacity in growing unincorporated Hillsborough. The Times knew about the 10 year $812 million road funding plan yet failed as journalists to ask questions about it before the election. Because the Tampa Bay Times Was All In for All For Transportation. Get the rail tax passed, then ask questions. Interesting post. It is only going to continually get worse. Processes at work will force the BOCC to "reevaluate" the $812 million. It will not be the same in 1-2 budgets. Need to keep track of this and the worsening congestion. Rumor has it that the RFPs for the train consultants are already being written.